Do you ever find yourself browsing TeachersPayTeachers and coming across all sorts of amazing resources you can’t help but explore . . . even if you don’t really need them! I’m completely guilty of this - so I just had to put some of these products together in one place to share with you! Ok, so this isn’t one resource, but a whole lot of them - and they are utterly amazing. Top Teaching Tasks puts together reading comprehension skills and puzzles to create these engaging, motivating resources which are perfect for a whole range of holidays or learning topics. I would imagine that this range will continue to grow, so make sure you follow the shop for more. One particular puzzle I wanted to highlight is a puzzle and so much more. 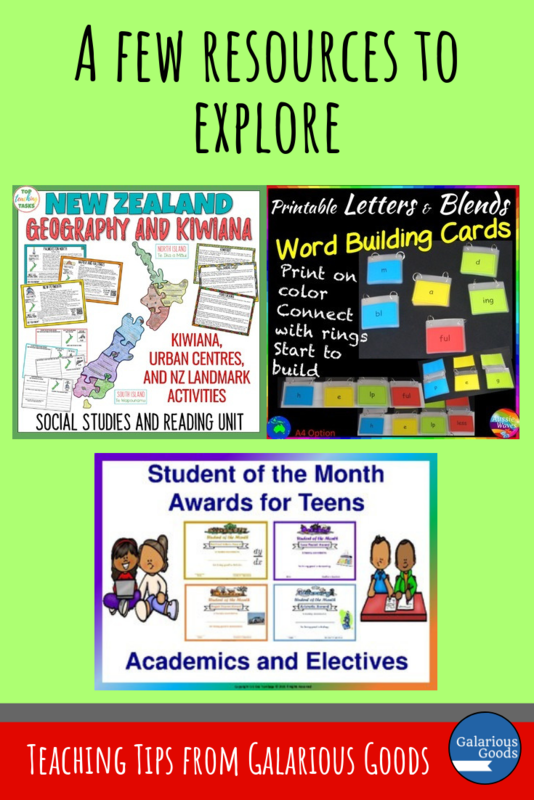 The New Zealand Geography and Kiwiana Culture Unit would be a must have for New Zealand teachers, but could also be bought by teachers around the world for independent extension work - taking a little look into a country which many love but may not know much about. It would also be a brilliant purchase for families who are travelling around New Zealand - I know we would have had so much fun exploring the country through this unit before we travelled there in 2018! I adore these beautiful posters. I think they would work well as a year long display in Australian upper-primary or social studies classrooms - a reminder that government (and Prime Ministers) are an important part of our life in Australia. As well as being lovely to look at - you know these will be updated if (when) we get a new Prime Minister. I believe the turn around to get Scott Morrison included was about a week - an amazing turn around on a event no one really saw coming! A hands on, engaging word building resource which can be used in a variety of ways with readers at a wide range of levels? Count me in! This is such a lovely resource for lower primary students and can be combined with reading, writing and hands on fine motor resources. Imagine combining it with writing in sand or to make nonsense words which build on current word knowledge! I can see it being a really valuable addition to Prep, 1 and 2 classrooms and being used to build phonics, reading and spelling knowledge. My kids have recently been engaging in a lot of dramatic play (my poor sister was their hospital patient yesterday. She says she’s now vaccinated for everything!) so I’ve been watching Little Lifelong Learners intently for inspiration. There’s a wide range of dramatic play resources available, but I especially love this Post Office set which I think would be brilliant to use in lower primary (and some parts might stretch into older grades as well). Another range of resources rather than individual product, these certificates are a must have for the classroom. With students of the month and end of the year options, these would be wonderful to have available to recognise the amazing work done by your students in your classroom. Just look how beautiful this all is! I adore this beautiful work and it looks stunning on the screen and printed out. While clip art is usually bought by resource creators, it can be a handy thing to have in the classroom. Most clip art creators have no limitations on personal, classroom use - so these images can be used in posters, classwork, art lessons, to make your slides and presentations fancy and more. I used the Australian symbols art work on menus for our school carnival (to go with a Possum Magic theme!) and they looked so professional and really drew customers into our stall! Are you a TpT browser? What have you found lately? Leave a comment below to share your finds! I'm celebrating the first year anniversary of Galarious Goods! Last week, I took a bit of an overall approach to celebrating and talked a little about celebrating in the classroom. This week, I want to take a little look at the shop I've created and which teaching resources are my personal favourites! This is one of my strongest performing resources, so I know I'm not alone in loving it. I first came across the Morris Gleitzman book back in 2009 when I studied it with some of the students I was teaching at the time. It remains such a strong and relevant book, looking at why people become refugees and what they give up to get themselves and their families to safety. The novel study was interesting to put together because Morris Gleitzman often uses short chapters and answering comprehension questions for each chapter would be an incredibly lengthy (and quite boring) process. I worked on grouping chapters which worked well together and then finding the comprehension questions which would work best for that selection of chapters. It was also the first time I created a 'all in one sheet' - a printable sheet with comprehension questions, vocabulary questions and a 'going deeper' activity - these could go together to make a book students could work through or go home as homework sheets. I was thrilled to repeat this with the Nim's Island Novel Study. As politics and governments become more talked about around the world, I believe there is a sense of people looking for ways they can get involved - including students. These lessons were designed to help students get involved in local, national and global issues - to think about what they really cared about, to research how they could get involved, to get information out to others and to take action. I feel that this is a really important message to get out to students - that there are things they can do to create a better world for themselves and others. This was probably the most comprehensive approach I've taken to lessons. I tried hard to think of everything a teacher might need to teach them and either provide them or provide ideas and resources which the teachers can include (I couldn't quite figure out how to include students' elected representatives to give class talks within a digital resource!). It was also the first time I included PDF presentation files which are formatted files to be used with projectors or interactive whiteboards or used on devices. What do you know about the Magna Carta, the Westminster System and how they influence the Australian system of government? Well this mini unit has everything you need to teach this to your Year 6 students. I thoroughly enjoyed writing this one, especially writing differentiated fact sheets to allow all students to be engaged with this important democratic foundation. The resource was awesome for this - particularly because I found some wonderful videos on YouTube about the Magna Carta - well worth watching with your students. I was also surprised at how relevant some of this information was - I really didn't think I'd be applying the research for this to modern day politics. It also has allowed me to really enjoy some documentaries on the topic and related topic - more knowledge is fun! This is a totally out of season resource to talk about and I don't even care because I like it so much. STEM and maths investigations is not something I do a lot of, but they are topics I completely believe in and thoroughly enjoy. I also love making Christmas chains, so this was the perfect combination. Many of these challenges are just plain fun - something to enjoy while you wind down for Christmas break. Students can look at measurement, strength, materials and creation techniques through these challenges, while thinking about mathematic and engineering processes. The book Pearl Verses the World by Sally Murphy is one of my favourites. I first read it not long after it was released and it produced all the tears. It's also a great one to read in the classroom or to have students explore on their own. These novel study resources ask students to look at comprehension and vocabulary and the novel as a whole, but also allow for the exploration of poetry, within and outside of the novel. I wrote this one on a beach holiday, so the feel of the beach is definitely throughout the resource for me. I also loved that I got to write my own poetry for this resource. It was great to flex some of those creative writing muscles again. Every now and again, you might see Facebook and Instagram posts advertising Teachers Pay Teachers sales. These pop up, with beautiful graphics and enticing promises, but you're not really sure what they're all about. What's the code? What is the discount? Why should you check it out? Well, we're here to hopefully demystify the process a bit, answer all your burning questions and to show you some of our favourites: perfect for you when the next sale comes around! What is a TpT Sale? Teachers Pay Teachers (or TpT) is a one-stop place to find downloadable teaching resources created by teachers. It's the best place to search when you're looking for teaching materials - small or large. Several times a year, TpT hold a massive sales event. Many sellers take advantage of this event to put their shops on sale for up to 20% off. TpT also provides a code which takes 5% off the original price - which means you get up to 25% off! How Can You Save More? The discounts for TpT sales are already great, but there is a way to save even more! TpT offers a wonderful incentive to leave feedback on products you love. Each time you leave feedback, you are rewarded with credit points - and these credit points, allow you to get a further discount. Leaving feedback is really easy - simply go to 'My Purchases' and click on the 'Provide Feedback' link. Remember to think about what kind of feedback would be useful to other buyers - tell them what you loved about the product! Many products are licensed for single teacher use only, which means you can’t share, but there is a way you can help your friends save when they want to buy the same product. Many TpT sellers provide special 'additional license' prices - usually at a discounted rate. Simply go to your 'My Purchases' page and click on the 'Buy Additional Licenses' button. This allows you and your friends to save money while being safe in the knowledge that you are following copyright laws and helping a teacher-author. How Do I Prepare For A TpT Sale? The dates of TpT Sales are closely-held secrets - we all want the surprise! So what can you do to prepare? Follow your favourite sellers on TpT and through their preferred social media and look out for sale announcements. Make friends with your TpT wish list - it's a great place to keep track of those 'maybe one day' product. Think about what you'll be teaching later in the year - spend some time looking for the best products available. Give as much quality feedback as you can. And don't forget to use your code and your credits when sales time comes around. What Are Our Favourite Resources? Galarious Goods loves the Hating Alison Ashley Novel Study Bundle because it combines my adoration of Robin Klein books with a fabulous set of resources designed to make it easier for Year 5 and 6 teachers to teach this great novel. Top Teaching Tasks loves the Myths and Legends Bundle Close Reading Pack because it engages students with a range of myths and legends from around the world (Volume One includes stories from New Zealand, England, Scotland and Greece). It also provides a wide range of higher order thinking activities! A Plus Learning loves Conflict Resolution: How to Handle Conflict because I have been teaching them in the classroom and have been very useful and effective to my students so I just had to put it out there to help others hopefully. 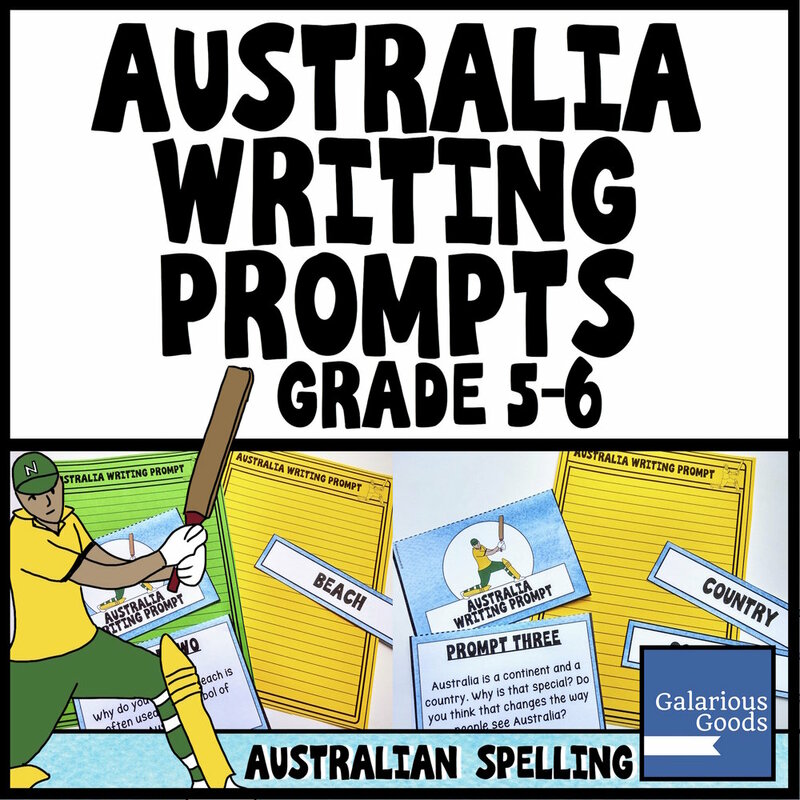 Aussie Waves loves the Figurative Language Bundle because I love teaching kids how to use and understand figurative devices in their writing and reading. I feel it is important and these tasks make it great FUN! We look forward to seeing you all at the next Teachers Pay Teachers sale!